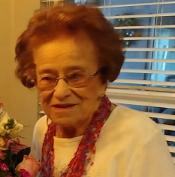 Mabel Felicia Rosman, 96, of Clearfield, PA, and a long time resident of Deland, Fl, died Tuesday, March 5, 2019, at her daughter and son in-laws home in Deland, Fl. She was born January 3, 1923 in Cardiff, PA.
For 20 years she owned the Little Haven Restaurant in Penfield, PA. She also owned Mabel’s Pizza Shop in Clearfield for 18 years. She was preceded in death by her brother Silvio Calliari, husband Aaron Rosman, daughter Mary Rosman, granddaughter Courtney Rosman, son in-law Richard Meyer and her parents Joseph & Marie (Serafini) Calliari. She is survived by sons Claron (Mary Ann) Rosman of DuBois, and Raymond (Shelly) Rosman of Olanta, daughters, Carol Meyer, of Deland, Anita (John) Ross of Deland and Cindy (Tom) Hackett of Indianapolis, brothers Carl Calliari of Sabula, Leo Calliari of Penfield, sister, Irene Gregori of Force, fourteen grandchildren, twenty-eight great grandchildren and three great great-grandchildren. Visitation will be held on Monday, March 11, 2019, from 1-3pm and 5-8pm and on Tuesday, from 9:30 – 10:30am at the Ralph M. Geer Funeral Home in Penfield, PA. A Mass of Christian Burial will be held on Tuesday, at 11:00am at St. Joseph Catholic Church in Force, PA with Fr. Mark Mastrian as celebrant. Burial will follow in the Church cemetery beside her husband. Online condolences can be made at www.nedzafamilyfuneralhomes.com . Arrangements are under the direction of the Ralph M. Geer Funeral Home of Penfield.